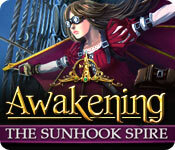 Our Awakening: The Sunhook Spire Walkthrough is a tell-all guide to helping Princess Sophia escape the mercenaries and scale the Sunhook Spire in search of a way to rescue the enchantress. Rely on our detailed directions, our gorgeous custom screenshots, and our simple solutions to all the puzzles you'll discover as you help Sophia find a way to break the spell that holds her parents hostage in an endless slumber. I can't tell you how excited I was to see another amazing addition to the Awakening series show up on the new releases. This enchanting series has become a bit of a favorite of mine, I mean, who can resist having your very own pocket dragon and a fluffy talking owl? Right? And while, I admit, after playing Awakening the Sunhook Spire, I didn't think it was quite as good as the last game, it still was beautifully done and I enjoyed playing it. 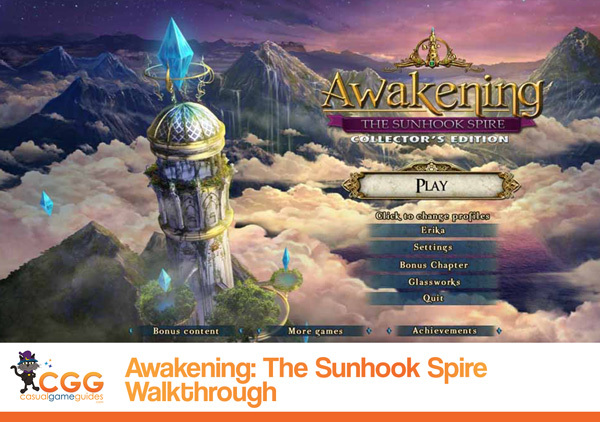 Therefore, to go along with all our other Awakening Walkthroughs, we've put together an Awakening: The Sunhook Spire Walkthrough. Here you'll discover everything you'll need to know to help poor Sophia climb to the very top of the Sunhook Spire, where the Enchantress who can break the spell on her parents, waits, imprisoned by a mysterious foe. You'll find in our Awakening: The Sunhook Spire Walkthrough plenty of custom screenshots, clearly marked highlighting all the areas of interest and key items you'll need. Pair this with our detailed instructions and our step-by-step puzzle solutions and freeing the enchantress won't be a problem. So whether you're looking for a constant companion as a guide or you just want help when you need it most, rely on our Awakening: The Sunhook Spire Walkthrough to see you through!